Do not give users one more form – give them one less problem. According to Schwesinger a form is a “framework of communication, made up of information which can be fixed or variable”. They can be a sheet of paper with check boxes and text fields, a printed list, or even a computer interface that requests, collates and distributes the information. 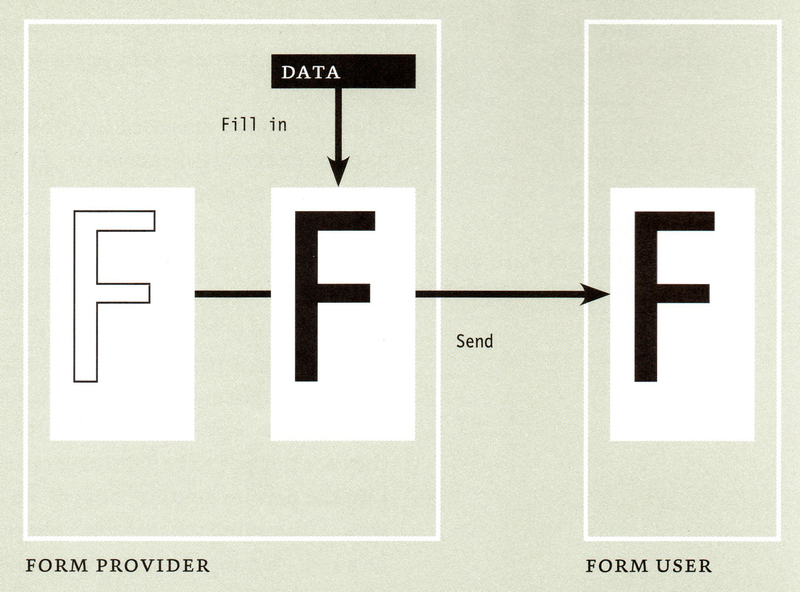 Forms act as interfaces between organisations and users, they are a means of communication. They guide interaction and additionally they create internal organisation. From the provider’s point of view, forms fulfil an organisational function. Forms need to fulfil a dual function as a means of communication and at the same time as a means of organisation. The content of forms is usually unpleasant. Designers need to work to make the forms consistent. Furthermore, designers need to pay attention to details, avoiding the creation of forms that look restrictive and discriminatory. Comprehensible language and clear design are the keys to achieve the design of good forms. When companies have efficient means of communication, they have a chance to stand out from the competion (other providers of the same service, for instance). Write what you mean, not abbreviations or abstract references. Avoid long strings of nouns (“Notification of our decision will be forwarded” to say “We will let you know”). Don’t switch terminology to refer the same subject. Use active language (is more personal). Use please and thank you. Corporate design > Visual image > Forms as design. Corporate communication > Ways of speaking to the world > Forms as texts. Corporation behaviour > Ways of dealing with people > Forms as attitude. 1455 Letter of indulgence: It used Gutenberg’s movable type print and leave some blank spaces to be filled. 1790 Tax form: Blank spaces but embellished. Additionally it has explanatory notes in the margin. 1892 Passenger list: It uses division by categories. Forms divide humanity. 1900 Business forms: Forms enabled the growth of industry and lithography allowed decorations. 1929 Modernist forms: Experimentation with typefaces but keeping it practical and functional. 1933-45 Forms in Nazi Germany: Forms can be instrument of arbitrary power, they are not always rational and neutral. 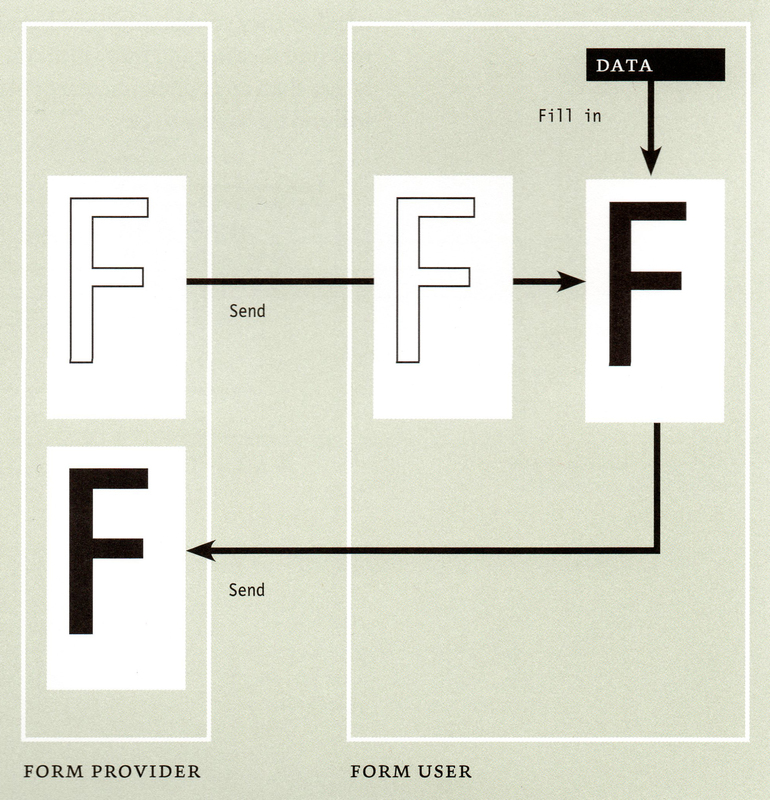 1983 Electronic data processing: Changes in technology have been the main reason to change the style of forms, giving more freedom to design but not always improving the usability or being more friendly. There are 2 categories of forms, communication and dialogue. Communication forms convey information and they do not expect response. Some examples are bills, receipts and certificates. On the other hand, dialogue forms gather information. There is interaction between the provider and the user and in this case, response is expected. Contract and declaration are part of this category. Application: They express claims and requirement. They collect sensitive information. Registration: They give access. They declare the desire to be part of something. Declaration: They obtain required information and for that they need to win the user’s trust. Orders and contracts: Standardised agreements to purchase, rent or work. Maintaining trust is part of the form responsibility. Invoices, bills and receipts: There is no payment without proof and there is no proof without form. Notices and statements: Pre-formulated communication addressed to one or more receivers providing information about a specific subject. Questionnaires: They collect personal data, attitudes and opinions through pools, surveys and ballots. They hold a dialogue. Certificates and passes: What they announce is demonstrably true. They make statements about people, situations and rights. Tickets, cheques and shares: They bear information about their value, who issued them, who owns them and what right do they have. Records and checklists: They can both be produced without the aid of forms, but forms speed-up the process an insure that all the important information is noted down. Direct mail (that demands response): This is most of the time used for advertising purposes, such us coupons. They need to follow-up the loud and often obtrusive approach of the ad and create dialogue. View and sorting the existing forms. Analysing channels of communication and administrative structure. Optimising and reducing the amount of information and the number of forms needed. Categorising and dividing the content of the form. Visualising on a macro and micro level (this is where the book focuses). Developing prototypes or draft versions. Testing on users inside and outside the company. (Then go back to visualising). Implementing the design system through manual, style sheets and templates. Checking the form effectiveness through observation and analysis. Adjusting the design and content. (Then go back to implementing). This process considers that testing is fundamental to check the results. The author goes deeper into graphic variables that need to be taken into consideration when designing a form. Many of these variables are basic references about legibility, use of colour, grids and layouts, typefaces, paper, formats, hierarchies and how all of the elements work together. Some of the variables need to be considered from the beginning, for instance if the form needs to be read by a machine. If so, gathering the date will be easier and automatised, but the design will need to fit the requirement of reading equipment. In the rest of the chapter, Schwesinger gives his opinion and advices about different possibilities for every graphic decision. He analyses and compares real cases, showing many options to solve common problems of form design, such as dealing with more than one language. Digital forms are non linear, there have links from one section to another. Digital forms can check inputs avoiding simple mistakes of the users. Digital forms can help people to fill them, with dynamical explanations. Digital forms can do calculation, making easier for the user to respond accurately. They are easier to update and it is immediate. The process (from the provider point of view) is faster with digital forms because data is delivered immediately. The process can fail for “mysterious” reasons and it is not always possible to go back easily. Sometimes when the form is sent, there is no evidence of the information. Digital forms are not always secure enough. Personal information can be transferred which make people feel insecure. They require technology and not all the users have the same access to it.